This MSN article reports two all but unbelievable stories. 'Play School presenters went in front of the camera stoned after smoking "the biggest joint you've ever seen", according to a new BBC documentary. Presenter Johnny Ball told a film crew that two of his co-stars filmed a nativity scene for long-running children's TV series Play School while stoned. I am lost for words, smoking weed on Play School! 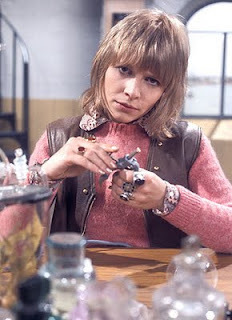 If you don't know who Katy Manning aka Jo Grant is then you obviously didn't watch Doctor Who in the 1970s. Here's a picture or four to bring you up to speed and a link to a previous article of mine. In case you're wondering the shots of the naked Katy Manning are not from Doctor Who! "In case you're wondering the shots of the naked Katy Manning are not from Doctor Who!" No, they were probably taken in the store room next to the studio where Dr Who was being filmed. Remember Toni Basil's hit 'Mickey'? Why is the EU and beyond in this economic mess? Are the figures too large for you? Egypt after the Arab Spring - nice place? Now why would Nick Clegg say that? Could he make it any plainer? Is the Israeli flag now verbotten in Norway? Do the BBC think Jews are not worth the bother? Is the government expecting rampant inflation? It's just your dirty mind! Could 2012 be a re-run of 1932? Literally nothing to play for?